Is Formal Education Necessary For Designers? This is a topic which seems massively debatable. There are camps for and against formal education for designers, each one with pretty valid observations to back up their viewpoints. Some say that a formal education gives a designer a more broad-based view about how they approach their work. In a classroom setting, since their work is evaluated and commented on, the advantage of having formal setting here is that designers can identify their weaknesses and learn from them. However, to get educated means a huge pile of student loans to pay off at the end of it all, a factor that puts off a huge chunk of designers, who then take the self-training route instead. And then there is the matter of the qualified vs. the non-qualified designer joining the workforce. If a designer with education qualifications ends up getting a better offer at a non-designing job, they’d be more inclined to take it. Designers with no formal education may end up with low-paying junior designer positions despite their creative flair or lack thereof. As we mentioned, there’s too much debate surrounding this. 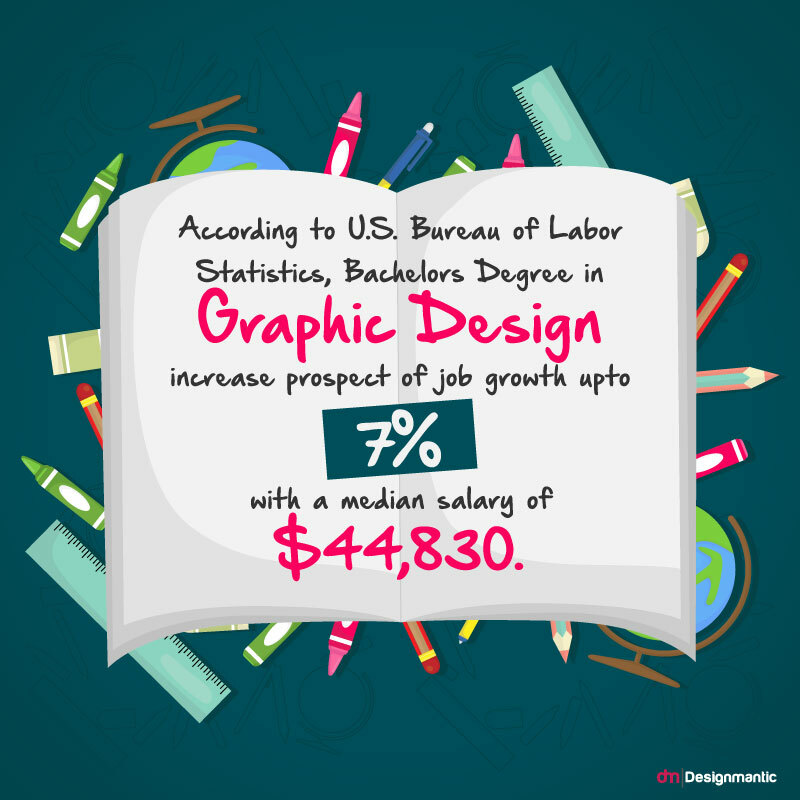 Related: 9 Things Graphic Designers Can Do To Make Extra Money! I would also argue for school because without it you are missing out on learning basic principles of design that all designers should share – including graphic designers, fashion designers, interior designers, architects, industrial designers, furniture designers and on and on… without those common core classes, it’s like flinging yourself into a house that doesn’t have a strong foundation. I’m talking about classes like Art History (years of it), drafting, photography, life drawing, 2D design, 3D design, color theory, rendering, architectural rendering, technical perspective. Outside of things that require big budgets for actual practice… most everything else can be learned outside of school. The originator of most things happened outside school if you go back far enough… and ALL new innovations come outside of school, when people discover/invent things out in the field. 1. Someone with a degree or certification knows what they are doing, and knows more than someone without those papers. 2. Someone without a degree or certification can’t possibly be qualified OR at least as qualified as someone who has those papers. Virtually anything taught in school can be learned on one’s own… or via apprenticeship on-the-job without "formal" education. Things like standards and basic practices and nomenclature are all things not unique to academia. If the quality of some profession unregulated gets uncontrolled, the reputation of professions get so easily tarnished and everybody can do a do-it-yourself approach. Sometimes, the penalty of a do-it-yourself approach is very high, if someone’s too lazy to check the connections, specifications and computations. It can even cost lives. By then, what’s the point of a profession? Isn’t it done so that you fulfill a duty of service in a community or a country, or you enjoy doing what other people don’t? Tests have been set up to limit people who could enter a certain profession or company. Inside a profession or a company, a mistake merits a high penalty. A profession or a company does not certainly want a high rate of error within their profession. As you might have surmised from the length and breadth of responses, this topic shows no signs of dying down. Education is important, even in today’s globalized world. A designer can still teach themselves without any prior enrollment in a course for the same, depending on their designing acumen and contacts to get a big break in the design industry. Regarding the last comment, on the importance of quality control to prevent errors, degrees offer no guarantee for that. Most schools and universities are government run, which means they are bureaucratic and ineffective. Any product or service offered by the free market is done more effectively and efficiently – whereas communism/socialism/collectivism has a historical track record of failure. That doesn’t mean that there are no outstanding people working within government bureaucracies – it’s the system itself that is at fault. Governments reward failure. If crime rates go up, police gets more money. If health care is run badly, hospitals receive more funds. The incentive is the wrong way around. Also the absence of a price mechanism makes it impossible to calculate where resources are required the most. Venezuela once again proves the point. A country with more oil than Saudi Arabia and literally starving. A degree is merely an indication that someone might be skilled. So how do we guarantee quality and qualifications in absence of governments? Well it is already been done on a massive scale: Yelp, Tripadvisor, Uber, freelancer platforms. That is the future. It isn’t fool proof, but much better than what we had, and much fairer too. On a freelance platform, a poor bloke from India who put all his savings in a computer with internet has an equal chance as an affluent person with a degree behind his or her name. Another point to make is the misconception that people with a degree have photographic memories for everything they learned at university. On each and every project I work on, I constantly have to reread documentation or learn new things. Also I find that things I learned from experience stick far better in my memory than theory I only read or heard about in college. You can read about riding a bicycle your whole life and still fall flat on your face when you try riding it for real.